In May Abita Springs assembled against fracking, raising the concerns we've had about fossil fuel development over the years. Impacts to the air, community health, and especially water pollution weigh heavily on people's minds on the Northshore. Louisiana has seen much of its population of means flee coastal areas in the past decade-- fleeing the industry that dominates our coast, as well as the rising waters of the Gulf. Communities displaced by industrial development have relocated to the Northshore. This turmoil has meant that Louisiana the slowest population growth rate of all five Gulf states, and steadily dropping representation in DC. But fracking has now come to the last place in Louisiana that has not been drilled. Young and old did not sit quietly as industry representatives and regulators neglected to answer basic questions about predictable oil and gas pollution--oils, heavy metals, and radium all contaminate waters during drilling activity. The millions of gallons of potable water needed to rupture shale will forever be taken from the water cycle. Hydrofracking involves another suite of "proppant" chemicals, such as n-butoxyethanol, a carcinogen that made Corexit so toxic. But LOGA representatives insisted on obfuscation, stating that toxic drilling muds were less harmful than kitchen chemicals. They impressed no one. 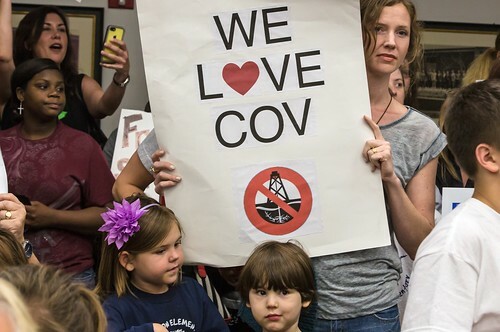 Gulf Restoration Network is proud to be among the many organizations and local governments challenging Helis Oil and Gas' application to drill in wetland forest on the Northshore. Helis, which is well acquainted with the law, has disregarded it, choosing to drill in a wetland it could have easily avoided. Slidell, Abita Springs, Mandeville have all passed resolutions supporting a prohibition on fracking. Scores of independent citizens--many of whom work in the oil and gas sector, Concerned Citizens of St Tammany, Lake Pontchartrain Basin Foundation, The Green Army, and Gulf Restoration Network have spoken often and strongly against Helis Oil and Gas' initiative to bring hydraulic fracturing to this heavily populated and quickly growing region of Louisiana.